Kevin Michael Collins was born August 4, 1946 in Springfield, Massachusetts. In high school he competed against future MLB players Mark Belanger & Fran Healy. Collins was signed out of high school by the New York Mets in 1964 for $25,000. He was part of Casey Stengel’s “Youth of America” young Mets players of the mid sixties. 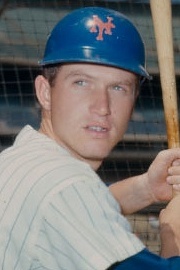 Collins made the club out of Spring Training 1965 at age 17. Unfortunately he tore a muscle in his throwing arm & had to wait until September to make his debut. His first career game was at Shea Stadium on September 1sy pinch hittingin the 5th inning against the Houston Astros. His first hit came on September 22nd against the Pittsburgh Pirates. He played in just eleven games that month batting .184. He then spent the next two seasons in the minor leagues playing on an infield with Ken Boswell, Sandy Alomar & Amos Otis. In 1966 he hit .251 with 6 HRs & 32 RBIs at AA Williamsport. He was then promoted to AAA Jacksonville playing there for two seasons. He had another brief four game stint with the Mets in September 1967. There wasn’t much room for Collins with Harrelson at short stop, Boswell at second base & Ed Charles being brought in for third base. He realized he would have to make the best of being a utility role player. In 1968 he played in 58 games mostly at third base hitting just .201 with one HR seven extra base hits a .233 on base % & 13 RBIs. His biggest day came on August 6th at the Houston Astrodome when he hit his only HR of the season& the first HR of his career. It was a three run shot off Dave Guisti, as he drove in all four runs in the Mets 4-1 win over the Astros. Brawl: Two days later while playing at third base, Houston’s Doug Rader came into third base with a pop up slide, landing his elbow to Collins jaw. He was knocked down, lying dazed on the floor as a bench clearing brawl followed. Coach Joe Pignatano went at it with Astros Manager Harry Walker, as did the rest of the team. The brawl got so out of hand the Houston Police had to step in to break it up. Many believed it was retaliation from earlier in the season when the Mets Tommy Agee slid into second base & spiked Joe Morgan, who was an Astro at the time. Collins suffered a broken jaw and missed just one week of action during the incident. At the start of the 1969 season, Collins was on the roster and appeared as a pinch hitter om Opening Day (0-1). He played in 16 games through May but hit only .150 (6-40). He hit aHR in the Mets 11-3 win over the Cardinals at St. Louis on April 20th. He was demoted to AAA Tidewater in early May, & being the true gentleman he was, he left a note in his roommate Ken Boswell’s locker that said “keep on hitting”. He also left a note in his locker which would be occupied by his roster replacement Art Shamsky saying “good luck kid”. Collins wasn’t in the Mets plans for the future, and on July 15, 1969 he was traded along with Steve Renko, to the Montreal Expos for 1969 World Series hero Donn Clendenon. Sadly the same day he was traded was his father’s funeral, after a sudden passing. His Mets career spanned four years, 89 games batting .185, with two HRs & 15 RBIs. He would always joke in the years that followed, that "Renko and I won the World Series for the Mets,” in reference to the Clendenon trade. In Montreal Collins played in 52 games from July 15th to October, batting .240 with 2 HRs & 12 RBIs. 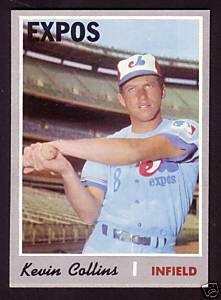 In 1970 with the Expos AAA team he hit .347 & had his contract purchased by the Detroit Tigers at the end of the season. He spent two years with Detroit playing on their big league club as well as with their minor league club, the Toledo Mud Hens. In 1971 Collins batted .268 in 35 games and played his last game in the majors. Collins left baseball in 1974 at the young age of 27, because he did not want to uproot his family anymore. He finished his brief six season career as a .209 lifetime hitter with 81 hits 6 HRs 17 doubles & 34 RBIs. Retirement: He would work in the automotive supply business for twenty years eventually becoming their Vice President. In 1993 while visiting a plant, a forklift ran over his foot & he lost half of it. He moved to Sand Point, Michigan and remained still friends with his former Toledo Mud Hens teammate, Tiger manager Jim Leyland. Collins was also a subject of a book with former team mate Tom Timmerman called “Role Players, the Unknown Fraternity”. Collins passed away in Naples, Florida at the age of 69 in February 2016.